The former Tri-Cities Coliseum broke ground in 1986 and opened its doors in 1988 as a hockey arena. After many years of changing private ownership, the City of Kennewick financially rescued and purchased the troubled Coliseum in August of 2000. Joining the Coliseum in June of 2000 was a year round ice arena called Rink “B” which was paid for in part by a Purchase and Sale agreement with Ron Toigo and the City of Kennewick. The city has supported the Arena since it opened. The buildings were then managed by both the city and a private management company for approximately three and a half years. 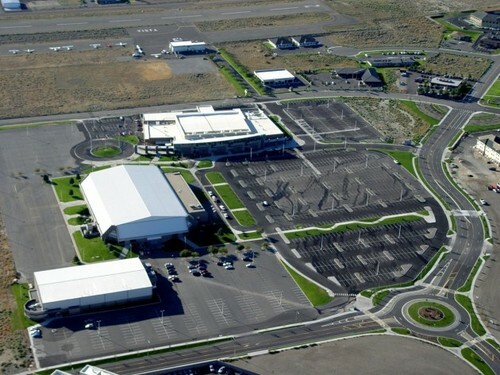 In April of 2004 the operations of the former Tri-Cities Coliseum and Rink B, through an inter-local agreement between the City of Kennewick and the Kennewick Public Facilities District, assigned the management and oversight to the KPFD Board. The Kennewick Public Facilities District engaged Compass Facility Management Inc. (now called VenuWorks, Inc) to oversee the day to day operations. This created the Three Rivers Campus as the two buildings were renamed, the Three Rivers Coliseum and the Three Rivers Ice Arena. The completion and dedication of the Three Rivers Convention Center, in June of 2004, made the campus 3 buildings strong. In October of 2005, the City of Kennewick and VenuWorks completed a Naming Rights sponsorship agreement with Toyota USA and Toyota of Tri-Cities to brand the Three Rivers Coliseum and the Three Rivers Ice Arena. They became the Toyota Center and Toyota Arena but both buildings continue to be an active part of the Three Rivers Campus. The Toyota Arena is home to the Tri-Cities Outlaws Hockey Team, and the Knitting Factory Concert Series. The arena also offers a comprehensive Learn to Skate program, public skate times featuring Birthday party opportunities, drop in hockey, men’s hockey leagues, a number of skating affiliations (see association tab), and offers a one day Zamboni school every June.